The self-styled Islamic State has claimed responsibility for Friday's gun attack in Egypt on a Coptic church near Cairo, without providing evidence. The claim came in a statement on the militant group's Amaq news agency. Eleven people including a policeman are said to have died overall. At least nine were killed in the attack outside the church near the Egyptian capital, while another two were shot dead some kilometres away..
A man on a motorcycle opened fire and tried to storm the Mar Mina church in Helwan City, sparking a shootout with security officers, according to Egypt's Health Ministry spokesman. Eight Coptic Christians were among those killed. The gunman was wounded and arrested, according to the Interior Ministry and church officials. 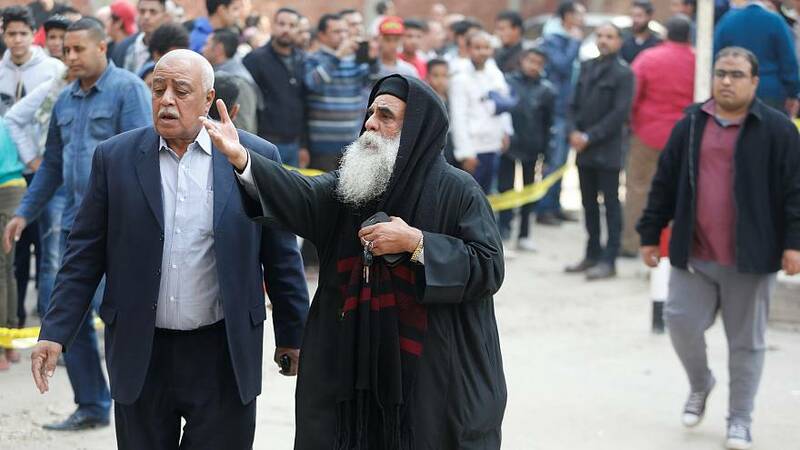 The Coptic Church said the gunman first shot at a Christian-owned shop a few kilometres away, killing two people, before heading to the church in the southern Cairo suburb. The Interior Ministry said he opened fire at the entrance to the site and tried to throw an explosive device. Egyptian Coptic Orthodox Christians are frequently targeted in Egypt. During a Palm Sunday service in April more than 40 people were killed and scores more injured during bomb attacks in two separate cities. In May nearly 30 people were killed when gunmen attacked a bus carrying Coptic Christians heading to a monastery.